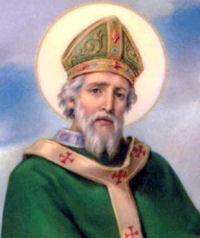 God our Father, you sent St. Patrick to preach your glory to the people of Ireland. By the help of his prayers, may all Christians proclaim your love to all men. Grant this through our Lord Jesus Christ, your Son, who lives and reigns with you and the Holy Spirit, one God, for ever and ever. Amen. The Station is in the church of St. Susanna, virgin and martyr of Rome. The first Christian place of worship was built here in the 4th century. It was probably the titulus of Pope Caius (283-296). Caius was St. Susanna's uncle, and tradition claims that the church stands on the site of her martyrdom.